So you have a car with an older radio that has an aux port but no Bluetooth? You may want to give this little guy a try. We were recently given a demo unit to review and were pleasantly surprised. The device itself is about the size of a dollar coin. It plugs in to your auxiliary port in your car and gets its power from a usb port. The device does come with an adapter for your 12 volt cigarette adapter and even has an extra 2Amp port for your phone charger. When on, the device has led's that light up the panel. It features fully backward compatible Bluetooth 4.0 for full-speed transmission and low power consumption. The panel gives you control over your device allowing you to fast forward, rewind, and stop your media. The HB01 also comes with a magnetic base that you can stick to your car so that your HB01 stays firmly in one place while still allowing you to remove it and handle. We have been using the device for about two weeks now on a Honda Accord 2007 non stop. 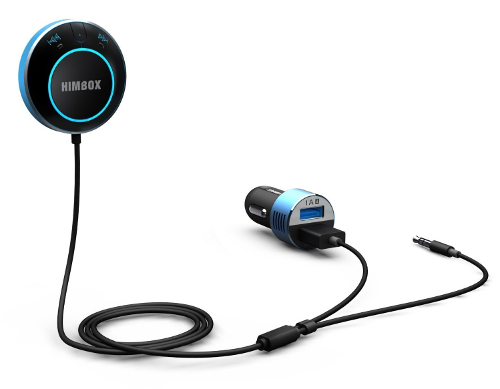 The iClever Himbox HB01 Bluetooth Car Kit on Amazon does a great job at transmitting media from your phone. We used a Samsung Galaxy Note 4 to connect. We decided not to use the factory radio but instead use apps from our phone, and set the phone to automatically connect to the Himbox HB01, it did an outstanding job automatically connecting to HB01. Once connected You are able to use the HB01 as hands-free solution for answering and receiving phone calls and streaming music from your Bluetooth-enabled phones. The media sounded excellent and not once did we have a hiccup of any type. The audio was clear and sounded as clear as if it was coming from the head unit in the car. We did find that when using it to talk on the phone, although we were able to listen to the conversation with no problem, the folks on the other end did complain of road noise despite the echo and noise cancelling technology. When the car was stopped, they person on the other end of the phone said it sounded great. 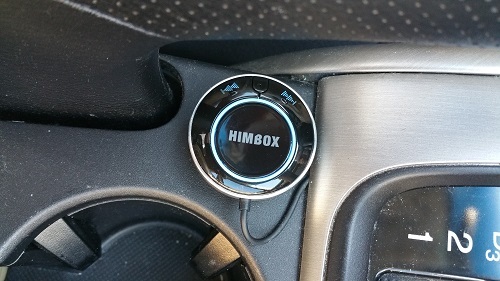 One thing to note is that the iClever Himbox HB01 Bluetooth Car Kit on Amazon has to be placed close to the driver seat so that it can pick up your voice. Although they could improve the road noise filtering we think $29 is a great price to add this functionality to your car.